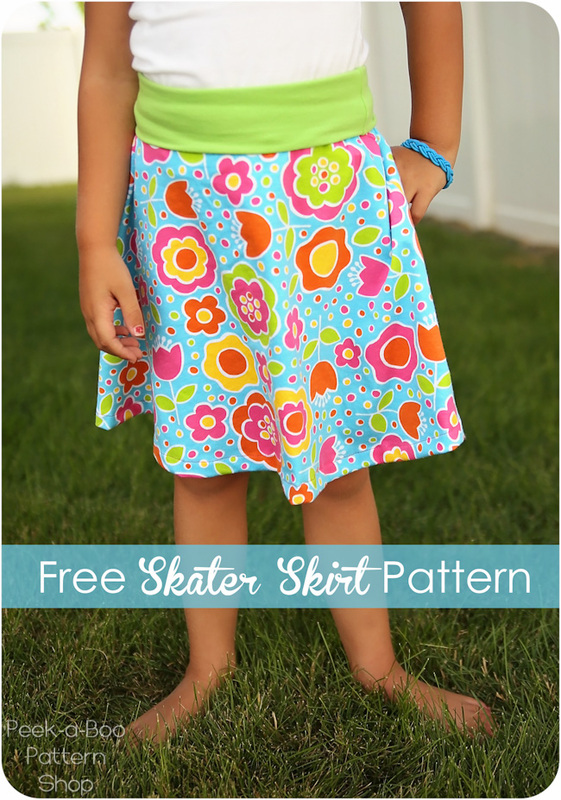 Today I have a FREE skater skirt pattern to share with you! 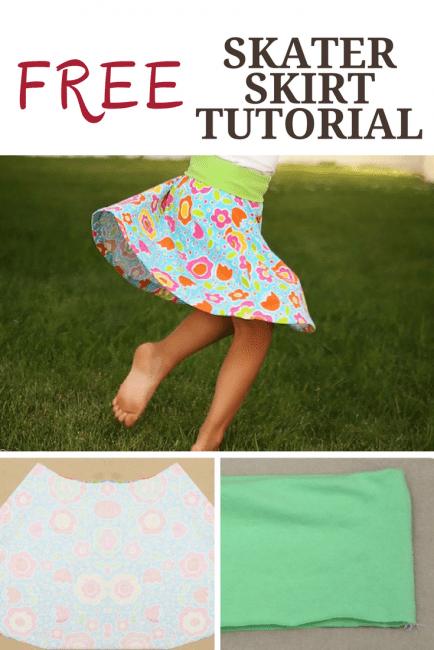 The FREE skater skirt pattern is a super quick and easy to sew and doesn’t take much fabric so you can whip up a stack of them in an afternoon! I know it put a smile on my girly and I can’t wait to sew up some more to donate! It’s even easy enough that your kids could help sew some too! Pattern: Download your free size 5 pattern here: Peek-a-Boo Pattern Shop Free Skater Skirt. Need it in a different size? Get the Spunky Girl Skater Skirt which includes sizes 3 mos. – 12 years. 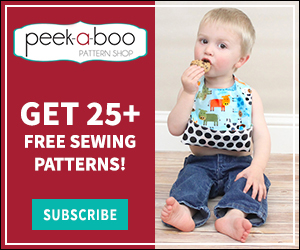 The pattern is free if you subscribe to the Peekaboo Newsletter or join the Facebook Group. 1/2 yard light-mid weight knit: jersey, interlock, cotton lycra, etc. 1/4 yard knit fabric with good stretch and recovery for the waistband. I used cotton lycra. 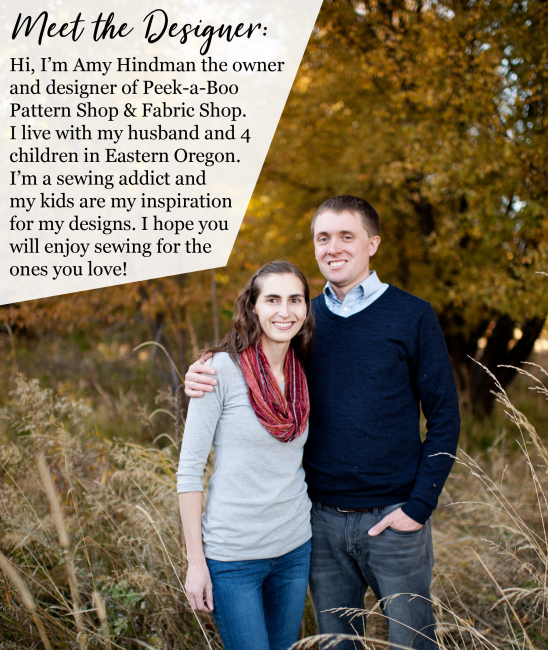 You Can find numerous great fabrics at www.peekaboofabricshop.com. Print out your pattern at 100% Check the 1″ scale box to make sure it printed correctly. Trim your pattern and tape together along the dashed lines. Piece 1 goes on top, followed by piece 2 and piece 3 is off to the right. Use a 1/2″ seam allowance. 1. With right sides together (RST) sew the short ends of the waistband together. I joined the group via email and Facebook. Is the adorable free skater skirt in sizes up to 12 no longer available?t Thanks. At the top of the post it says the skirt is available in size 5 for free if another size is needed a link is posted to purchase pattern. I will say it is worth every penny and it makes the most adorable skirt. Thank you for sharing this pattern. I modified it to fit my 2 year old and it looks great on her! So cute. I will use one of your skort patterns to make matching inside shorts to go underneath. purchased half yard of 45″ wide skirt fabric and cannot figure out how to place pattern on fabric so I can cut two pieces on the fold. Help, please. never mind, I finally saw it on pattern piece, so sorry for the request when it was right in front of me. I love the pattern by the way. I am making 10 for Angels Fostering Network in OK and have challenged any of my sewing FB friends to join me. Got the skirt pieces cut out today!!! half way there! Thanks for asking the question and then telling me where to find the answer. I looked and looked and then I read what you wrote. Problem solved, Thanks! Thank You so much for this. Is there a short pattern that I could purchase to add for privacy. I have 2 grand daughters who forget they have skirts/dresses on and modesty is priority to us. This is so awesome! We are s foster home and this is such a great thing to support the foster home community! Thank you so much! Thank you so much for sharing this pattern! My daughter is going to be so excited to wear some new skirts!